Hello! I’m Robby Rothschild, a Santa Fe native who has devoted his life to music in its many forms. I’ve earned a Masters’ in composition here in New Mexico, and have studied at the New England Conservatory in Boston, in a municipal conservatory in Paris, on the road around the folk clubs of the country, and at the feet of the masters in my grandparents’ living room as a kid. My life’s commitment to music began at the piano, at the age of 8. This magnificent instrument set me on the path, and has remained central to my musical work as a composer and musician. I’ve toured internationally with own musical project Round Mountain, as well as with acts like Ottmar Liebert, Kip Winger, and Panjea. All of these explorations have deeply informed who I am and how I listen. Over the last five years, I have discovered the incredible satisfaction of piano tuning and repair. I have studied with Roger Hathaway, Steve Pearson, and Fred Sturm. I’m eager to spend some time with your instrument. I here present my musings, from the inside of the brilliant, challenging, and often profound landscape of bringing harmony to people. I hope they might bring forth some enjoyable response in you. And yet more subtly, the piano embodies a formidable compromise inherent in our musical system. The physics of soundwaves demand that, in order to be playable in twelve different keys, “pure” harmonic intervals must be sacrificed, and the attendant “shadow” of dissonance distributed evenly among the notes. Like a carpet slightly too large for the room it’s in, the tuner’s challenge is to try to spread one wrinkle evenly across the floor. 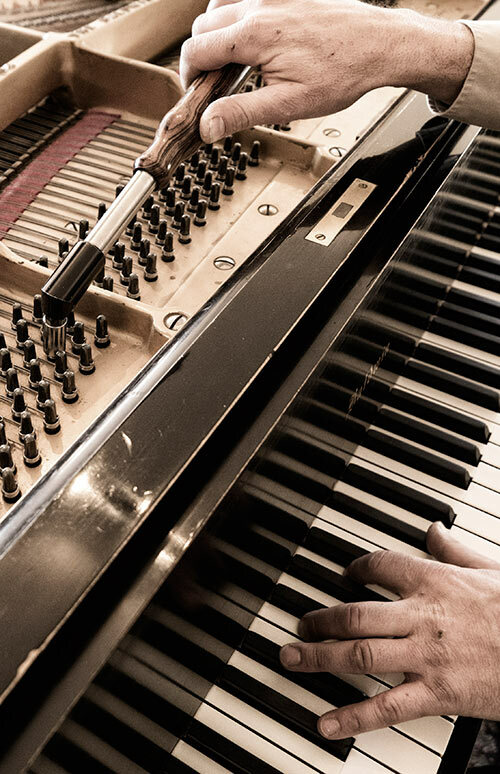 The art of piano tuning developed around this line of thinking, until with the onslaught of the digital age, it was discovered that the partials (also called overtones – higher notes that sound along with the main note) of piano strings are slightly out of tune with the fundamental (main note) itself! And not to a fixed degree – the inharmonicity of strings, as this phenomenon is called, varies from piano to piano and from string to string within each. So no wonder tuning is considered an art! Each style, and to some extent each individual piano, represents a unique problem with a unique set of solutions. And yet, as someone who’s spent most of his youth and adult life working on his ear, I can think of no challenge more satisfying to pursue than the beauty of a well-tuned piano. Our job is to strike a deal with the gods. Formidable as the task is, I am not stymied. For although it’ll never be perfect, it can always get better. Robby has done a very fine tuning on my piano. I am a pianist used to playing Steinway grands with the very best tunings… he made my piano sing again! I am very pleased with his work and will use him again. I can TOTALLY vouch for Robby’s prowess wielding that tuning fork of his. It was only yesterday that he put my piano right back into its sweetness – and the two of us are happy together again. If you have a piano and that piano needs a tuner, look no further – Robby Rothschild’s your guy. I had some former students over this weekend and we used the piano that Robby tuned. Since it’s been in my family for over 60 years, I was amazed at how well it kept it’s intonation after he tuned and repaired it 2 months ago. Robby is the man! Let’s have a look at that piano!